The Global Bio-Based Chemicals Market is presumed to register a remarkable CAGR during the forecast period (2016-2023) owing to the growing demand for pharmaceuticals, asserts Market Research Future (MRFR). Bio-Based Chemicals are usually derived from biological origin or biomass such as animals, plants, and trees and are classified into biofuels and bioplastics. The increased consumer awareness regarding environmental responsibility is fueling the market growth. November 12, 2018: Scientists have recently discovered a novel method to synthesize furan-2,5-dicarboxylic acid from a glucose derivative of non-food plant cellulose. It paves the way for replacing petroleum-derived terephthalic acid with biomaterials in plastic bottles. The prominent players operating the Global Bio-Based Chemicals Market are NatureWorks LLC (U.S.), Mitsui & Co. Ltd. (Japan), PTT Global Chemical Public Company Limited (Thailand), Koninklijke DSM N.V. (Netherlands), Braskem (Brazil), Mitsubishi Chemical Corporation (Japan), Metabolix Inc. (U.S.), Corbion (Netherlands), BASF SE (Germany), Zhejiang Hisun Biomaterials Co. Ltd (China), TEIJIN LIMITED (Japan), BioAmber Inc. (U.S.), Synbra Holding Bv (Netherlands), Danimer Scientific (U.S.), and Myriant Corporation (U.S.). 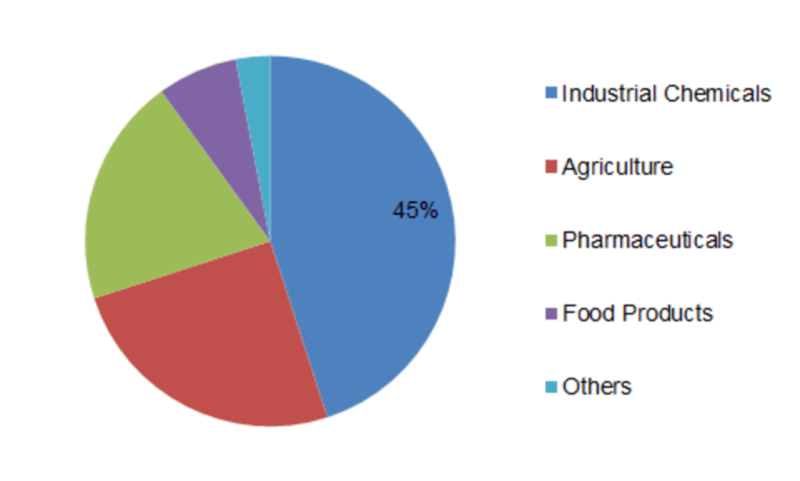 The Bio-Based Chemicals Market is expected to expand at a considerable rate owing to the increased oil prices, growing support for Bio-Based Chemical companies, and movement towards sustainability by the manufacturers. Strong support from the government for eco-friendly processes and sources are creating ample opportunities for the Bio-Based Chemicals Market. Due to the growing demand for personal care products and pharmaceuticals, the Global Bio-Based Chemicals Market is considered to flourish. Additionally, strict regulations from the government against synthetic chemicals such as Registration, Evaluation & Authorization of Chemicals and Bio-Preferred Program are triggering the demand for Bio-Based Chemicals across the globe. Moreover, growing demand for disease-free and high crop yield and use of Bio-Based Chemicals as a nutrient and food supplement is contributing to the market growth over the years. On the flip side, food safety issues coupled with high prices of Bio-Based Chemicals are some of the major concerns impeding the market growth during the assessment period. The Global Bio-Based Chemicals Market has been segmented on the basis of Applications, Products and Region. By Mode of Products, the Global Bio-Based Chemicals Market has been segmented into biofuels and bioplastics. By Mode of Application, the Global Bio-Based Chemicals Market has been segmented into agriculture, industrial chemicals, pharmaceuticals, and others. Among these, the industrial chemicals segment is presumed to dominate the global market owing to the high demand from several end-use industries such as composites, engineered polymers, additives, and others. The agricultural segment is considered to expand at a higher CAGR owing to its wide range of applications such as biofertilizers and biopesticides. Geographically, the Bio-Based Chemicals Market span across regions namely, Europe, Asia Pacific, North America, and Latin America.